Microsoft has finally taken the wrapping paper off of Sway. The digital presentation application is now generally available for all Microsoft users. Sway was initially unveiled in 2014 to help professionals create and share documents that feature creative interactive elements. It can help you move away from boring PowerPoint presentations into things like puzzles, quizzes, and choose your own adventure stories. By using an intuitive design engine that adapts and responds to the interactive elements in your content, Sway helps you combine multiple pieces of digital media into a cohesive layout that flows images, text, music and video into a narrative. The application has only been available in a Preview demo for early-stage testers. Today, anyone can access, download and begin using Sway. One of the new features included in the Windows 10 version of Sway is a new Navigation pane, which enables you to better control how and when content is revealed during a presentation. Rather than scrolling from left to right or up and down to see more than one presentation element, you can group multiple sets of images and text into one slide and zoom in, shrink, and change the focal point within one screen. Another key update is Sway's integration with Docs.com. 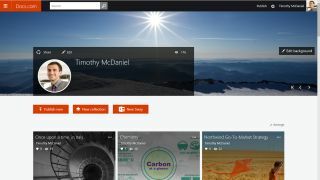 Think of Docs.com as a YouTube for Microsoft Office elements like documents, spreadsheets and presentations instead of video. Now you can publish Sway presentations to Docs.com so that others can find, browse and share your creations. Within Docs.com Microsoft now lets you organize your content into collections so that search engines can more easily discover your documents based on how they're organized. Anyone with a Microsoft account can now log in to Sway.com to access the application. Business and education users can access sway in their Office 365 applications. Sway for Windows 10 is only available on tablets and PCs, but it will be available on Windows mobile devices "in the coming months," according to a Microsoft statement. Sway is also available on the iPhone and iPad.